Architectural Concepts Podcast: Zen of Software Development is now available! 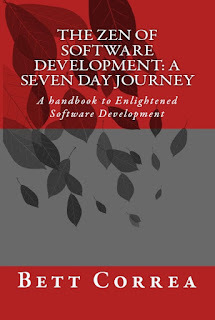 Zen of Software Development is now available! Bett Correa has published a new book! Zen of Software Development. Do you dream of working on a team of enlightened people who create software which users love? Stop dreaming and start living! This book will get you started on your journey. Zen is now ready to overtake our offices and enable our teams to create software together. I have laid out exercises you can do alone or with your team members to create a new awareness and Group Mind. I’ve spent over 15 years in software development and gone from being a web developer, to a DBA, to a project manager, to a business analyst, to an end to end solutions architect, and a product owner. The pattern I see repeated over and over again is teams missing deadlines, unhappy users, buggy code, and over-budget software. The reasons I blame for this are also the same time and time again: teams fighting, not understanding each other, being stuck in the past, not understanding the users, and overall stressful team environments. This small handbook lays out a step-by-step process to create a new awareness, first in yourself and then, you’ll be surprised to notice, in your team members. I don’t waste time on a lot of theory but focus on the facts. The layout is a seven day guide in which you have one small chapter to read each day with an exercise to help give you an awareness of the present. There is also a meditation to practice each day.